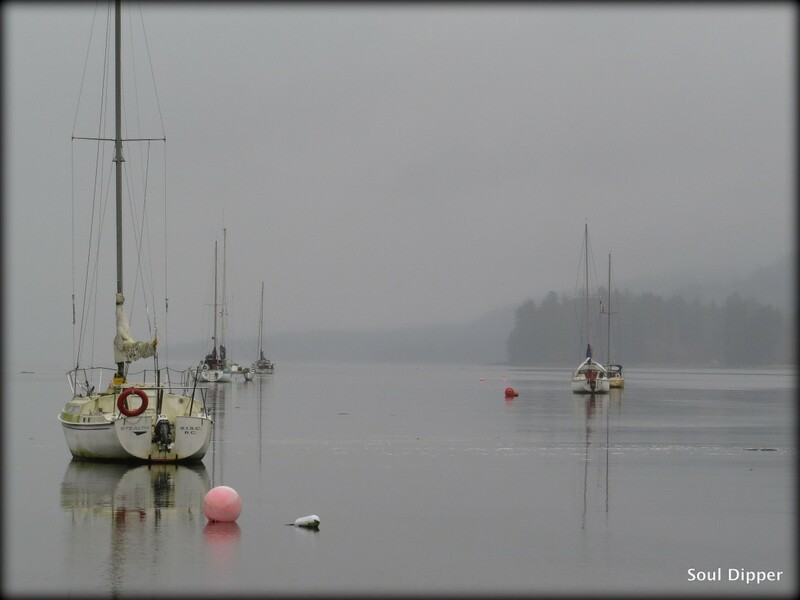 My soul’s net unfurls in a wide arc. As it floats down to claim its catch, I have raced to be under it. Because the object of this blog is disclosure, the mysterious contents of the prize will be shared. Ten days ago, a friend, Jay*, through email, asked if I would like to receive five visitors for five days. Since I did not have to change bedding, cook, or clean up after them, the proposal caught my attention. I read the details. Jay explained that five Archangels would arrive on Thursday, November 18th, 2010 at 8:45 a.m: Archangel MICHAËL, Archangel GABRIEL, Archangel RAPHAËL, Archangel URIEL and Archangel METATRON. 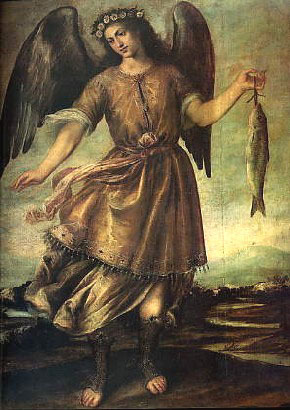 Archangel Raphael performs all manners of healing. 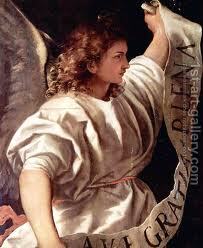 Archangel URIEL "God is my light" -angel of repentance who watches over thunder and terror. Archangel METATRON, the highest of the angels and serves as the celestial scribe. 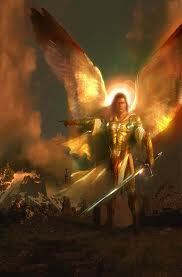 Concensus does not exist in the world religions as to the roles, status and authenticity of Archangels. Some religions do name seven archangels. Of those seven, only four are on this tour, visiting my home. Archangel Metatron seems obscure even though some claim that he is the Highest of Archangels. He is not even named in the list of Seven (linked three sentences ago). He was seen sitting down by some sort of judicious body, a gesture reserved only for God apparently. Seems he may have fallen from grace over that political incorrectness and is just waiting to resume his position. The delightful fact about this? While they are here, I can ask them anything. No limits. No barriers. I can ask for everything. And so I will. I’ll even ask Metatron about his lack of mention in the list of Seven Archangels. – a white flower that I will put outside after the Archangel’s departure so it can go back to the earth. – on the envelope I have put an apple, which I will eat after their departure. The instructions go on to say that the house must be tidy and welcoming so that these Divine Beings can take position with love and peace. I like these Archangels. I don’t function well in clutter or an unclean environment either. My mind wanders, but I’m not sure whether it’s because I’m judging the scene or if I’m looking for the “hot spots” to avoid. Unless it is my mess, I am happy to leave it to the one responsible. I learned to ignore messes very well. My mother gloried herself in many hearts due to her incredible humanity, but she did not endear herself to any of my secret domestic facets. As a teenager, if I touched something in the house that was not mine, someone would claim that it was my duty to clean up the wreckage around it. Over the next five days, I will tidy up after Duc-la-Chat and myself. While the Archangels perform various blessings, I am to pray, contemplate and meditate. When I go out, they’ll come, too. Back to driving the speed limit for a while. Tonight, I’m attending a woman’s circle, but I’ll chance that the “fellas” will remain invisible. Apparently, I have a daily appointment at 10:45 p.m. at which time I may ask questions and listen for answers. They like to communicate between 5:00 p.m. and 7:00 p.m. and between 3:00 a.m. and 5:00 a.m.
1. I submitted a short story to the Writer’s Digest. Jamie gave me the nudge so I complied. Please, Archangels, arrange for me to win first prize. The prize includes a trip to New York and some cash. That’s the “neon” part of winning. The “soul” part? The article is published and, with a trip to New York, I have the opportunity to visit one of my Soul Journer friends, Kadian. She lives in the vicinity. 2. I ask for concrete proof and assurance that I have enough assets to continue living life as a writer, free from worry about earning money. 3. Please assure that Duc is continuously in good health. Over the next few blogs, I’ll report on the little things that have already amazed me. 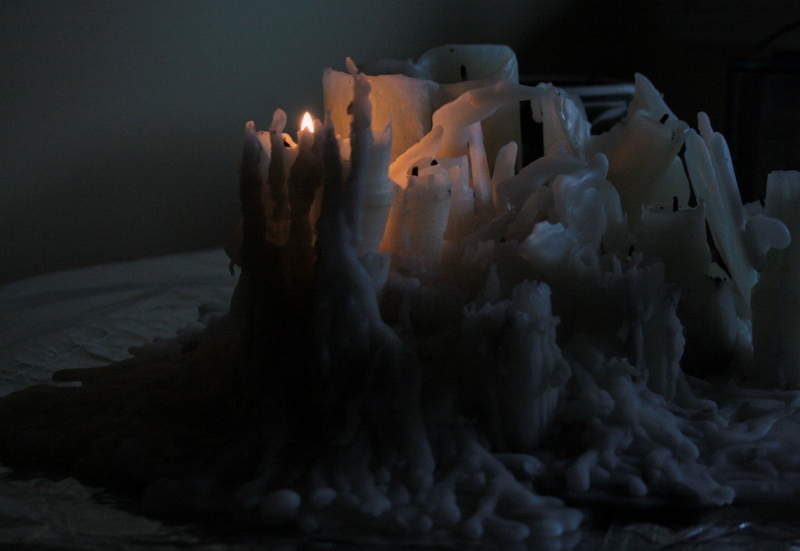 Since I will be going through a number of white candles, I will continue creating my wax sculpture. The other object to this whole exercise is to be open, to make myself vulnerable, to show you my soul. On a TED.com video, a talk moved me to take this stance and build a window into my life. Breaking away from my love of privacy, this will be a challenge. Besides, it will be fun to share what the Archangels will do/are doing in my life and my home. My fear is not what you will find. Rather it is what you will not find! Thanks, Susan! I will go for it! Get ready, I won’t be surprised if you get asked if you want a visit. Soul Dipper, I am jumping up and down as if you already won the prize. I will be praying hard for this one. I can’t wait for the angels to arrive at my doorstep and I am anxiously awaiting your blogs about their visits at your place. I think I need to give myself a energy treatment. I can’t seem to calm down after reading this blog. So much to be excited about. Here we go, Kadian. I’ve got my suitcase out and am looking for a cat-sitter. Oh, I guess this is next spring, but we can still dream and wish and believe! FWIW, the writeup in the teeny booklet accompanying Doreen Virtue’s Archangel Oracle deck calls out Metatron as one of only two archangels who was once human (Sandalphon being the other). So if you’re seeking more things to ask, that might be an interesting one. Love the white candle sculpture. 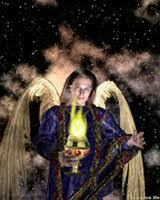 “Metatron transmits the daily orders of God to the angels Gabriel and Sammael. Metatron is often identified as being the twin brother to Sandalphon, who is said to have been the prophet Elijah. Wow. Hadn’t heard that about Metatron’s possible connection with the Tarot. For months now, I’ve been part of a local meetup called Intuitive Tarot, and I’m using my decks to strengthen and refine my connection with my intuitive knowing. The booklet with the Virtue cards (which are simply oracle cards, not Tarot) also connects Metatron with sacred geometry. More than once, in following the guidance of the cards, I’ve asked Metatron to clear and balance my chakras by sending a geometric form known as a Metatron cube through my crown and into my body. It’s the fastest method of clearing chakras I’ve ever experienced. Love the fact that you are honing your intuitive skills, Sally. What a great way to do that. Hmmmmm…makes me want to talk with a friend who recently gave me a very helpful reading. I will light my own candle in support of you during their visit. Best wishes and much love. Thank you, Cindy! What would we do without all the support from good women in our lives? Here we are, now, with a world full of ’em! Angels are perfect houseguests and always welcome in my home. How sweet of you to ask. The people in my life who wanted the angels to visit have already participated. Perhaps ask to have someone revealed to you. Oh, what glorious visitors you have. Thanks, Mel – These guests are going to be very pleased. There’s even a candle burning in South Africa! I am glad that you are writing about this experience. I am up toooo early and your blog was the first thing that I visited. Now if I can get the signal strength a bit stronger, then I can watch the video on the next post. Thanks for the encouragement, Tammy. 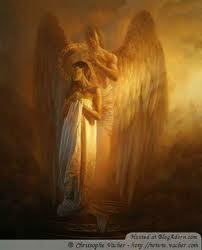 Angels reveal all sorts of aspects to us if we are willing to listen. I’ll be writing more about their time here. Hi Amy .. the Brene Brown video TED talk .. is AMAZING .. I’d been pointed in her direction in the last couple of months but hadn’t got there .. but this talk is extraordinary .. and opens life up so much. I can see exactly what you mean here .. thank you for giving us the video link .. Yes she presents a great message. I just listened to part of a speech from the Dalai Lama at a Leadership Conference in India yesterday. He reminded me that by having an attitude of compassion, my heart automatically opens. I can be receiving, transparent and inviting. We are social beings and are geared toward working together, but we have this little thing called self-centeredness that causes us to “close” and prevents us from receiving all that is available to us. Look at this responses. Wonderful. Just as wonderful as your brave post, Amy. An energetic group is/has formed out of these Internet friendships. FYI: I had a nudge to point you in the direction of the contest. Whether that means you will win, I don’t know. I do know it is absolutely about you moving forward to get your work published. Good luck. I’ll be rooting for you. If you do win (hope and pray), you’ll have to give my regards to Old Broadway because that’s my beloved hometown. I believe in Angels. I do my Reiki work with them. Powerful and Comforting. Write on, my friend. Good stuff. How did you get the angels to visit you. I would like a visitation too? I took the steps as outlined in this Post. But they’re always with you. Always. Simply putting your attention on them means they are with you. Put 3 candles in the highest place you have at home, inside a plate with sugar all around the candles. one wish for love and one impossible wish. Publish this on the third day after requesting the wishes (as I am doing here) or mailing to another in the classified ads and see what happens on the 4th day.